Have you ever had food poisoning? Remember what it was like? The cramps. The pain. The fever and chills. And who could forget the explosions from the north and south? Good times. Now let’s say the person who sold you the food (not the maker, but the food seller) determines that rather than upset the food maker, she decides to throws her “highest priority”–food safety– out the window and agrees to keep selling the food. Remember, this is the food that had you driving the porcelain bus for three days. How does that make you feel about the food maker and food seller? How might you act based on their actions? Does it bother you that nobody seems to be looking out for you and 18171 * of your friends who also got sick? What I’m describing is what is currently happening with Foster Farms’ fresh raw chickens sold via Safeway stores. The chicken that was contaminated with Salmonella Heidelberg was not recalled. Now I understand why Foster Farms would cut this deal with the USDA, but why did Safeway go along with it? Now I could focus on Foster Farms here, but they already made a deal with the USDA. Stacy Finz at the SF Chronicle has the latest on them. But I want to reach out to the decision makers at Safeway. I have a history of alerting advertisers suggesting they stop associating their brands with toxic products (SF Chronicle link) So now I’m going to do something similar, I’m alerting three women at Safeway. Larree M. Renda. Executive Vice President. Diane, Kelly and Larree. Your company, Safeway, is selling a product that has been proven toxic. The decision to not recall it is tainting your brand. You already know what the right thing to do is. Time to look at own internal guidelines, values and corporate governance documents. Look at what you demanded of your suppliers and partners (like Foster Farms) to agree to and ask yourself. “Is this what is best for the company brand?” Read your own webpage titled Employee and Customer Safety. There is nothing more important to us than the health and safety of our customers. One critical component of this is food safety. We continually monitor government recall lists and provide current information to our customers about potentially unsafe, hazardous or defective products. We also have a food safety certification program required for all employees who prepare food in our stores to further protect the health of our customers. Does that mean something or are those just pixels on a page? I believe, and have proof, that the humans within a corporation can figure out how to do the right and still maintain profitability. You, Larree Renda, are smart enough to help Safeway, hit your numbers while not sickening your customers and hurting your brand. That would convince most CEOs. Bottom line! Supply lines! Technically legal! Of course if the CEO got food poisoning from his own private label chicken he would remember the feeling in his gut for weeks, months or ever years when looking at Safeway Farms chickens. That is the kind of brand identity you do NOT want. You do not want to be known as Un-Safeway. You have leverage, what will you do with it? Get financial concessions or demand higher safety standards? Foster Farms is ripe for a massive safety revamp, especially if distributors and private labels demand it. In fact, the entire industry needs a food safety overhaul but they will all scream, “We will have to charge you more!” That is a typical BS line, they could deliver safer food, but it would mean less money to their shareholders and executives. That’s their real pain point. 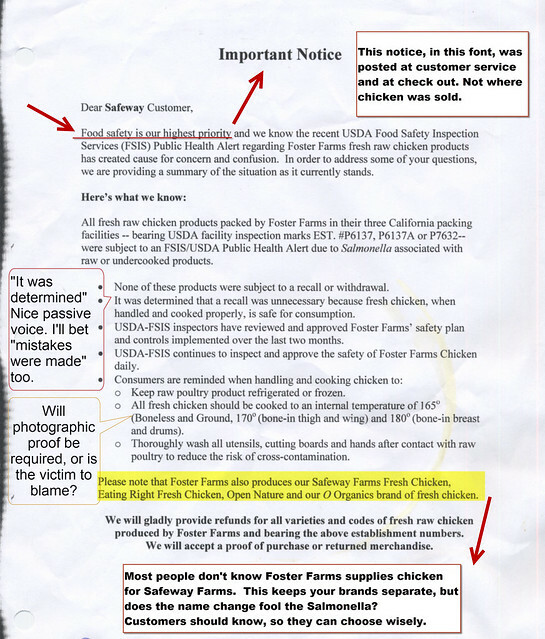 I don’t know exactly how Foster Farms worked out the Warning Letter deal with the USDA, but based my personal experience with Big Chicken back in 2007, the USDA can be convinced to do all sorts of things, especially when they get some pressure from “industry partners”. In that case, a major chicken supplier fed melamine-tainted pet food chickens and pigs which were then sold into the human food supply. This was the same food that killed over 8,000 dogs and cats and sickened approximately 16,000 others. Instead of forcing the Big Chicken company *cough* Tyson *cough* to recall the 20 million chickens and 56,000 hogs, they got the USDA/FDA to come up with a “research letter” that said, “By the time it reaches humans it will be too diluted to hurt them.” So do I think that Foster Farms could have convinced the USDA to not demand they “voluntarily” recall the chicken? You bet. But Foster Farms cut the deal, and they aren’t you. You Know Who Else Ignored Food Safety Issues? Safeway Has Good people. Let Them Do the right Things. Case in point. I talked about this Warning Letter to one of your Union checkers. Not only did she dig into the data and determined exactly which chicken it was in question, she personally talked to every customer she saw buying it to make sure they were aware of the warning letter. All but one decided not to buy. That person said they would prepare it correctly. She is experienced, smart, knows and cares about your/her customers and she personally made customer safety her highest priority. Are you going to let her down from the top? If you can’t get every checker to do that, maybe post the Warning Letter right where it is sold and don’t just bury that it’s also your private label that is contaminated. Safeway was voted one of the most ethical companies in the world. Folks like your union checker are part of that. I’ll bet Diane Dietz was damn proud of that award. As was Safeway’s Corporate Social Responsibility creator, Larree M. Renda. Or was that an empty award? If You Touch The Tainted Chicken, Then Touch The Safeway Brand Will It Lead to Cross Contamination? 1) Fix the problem instantly. For me and 18,171 others, that’s too late. Last Friday was the first day my stomach stopped hurting. 2) Hire and listen to the really highly paid political brand consultants. They will suggest you convince people that the bad experience is totally not your fault and that doing anything beyond the bare minimum will draw attention and isn’t cost effective. The idea is to avoid, disassociate and redirect. They will tell you that the old, “Johnson and Johnson recalled all the Tylenol and customers loved them” age is over. And they are right, but their slick suggestions aren’t enough. They will suggest you can use the USDA weasel words as a legal shield so you can keep selling product. They will suggest you push the burden of care onto the customers. All standard ideas, nothing bold, nothing looking beyond this quarter. These ideas appeal to a narrow subset of executives, often the ones who hire them. How much do they really believe what they say? Ask them if you can pay their invoice entirely in the contaminated chicken. 3) Get back to the heart of what you are. Are you proud of selling tainted food to customers? Even if you warn them? Don’t run away from your values, run toward them. If you don’t believe them stop wasting you money talking about them and doing them. I’m sure there are some people on Wall Street, and in your own company, who think all that “we care about the community” crap is for co-ops and Patagonia. Who will remind you of the ‘razor thin margins’ they have and how you have to make “trade offs” to ensure continuous growth. You know that whole, “Delivering Shareholder value is the most important thing” line that has been pushed by Wall Street in order to keep those quarterly profits coming? Wall Street doesn’t care about your customers or your brand. If you make thousands sick, but keep those profits high, they are cool. Sure if enough kids die they will punish you, but they will take no responsibility for you cutting corners to please them. Wall Street is on the side of profit via any means necessary, right up to dead kid day. I don’t think that JP Morgan Chase is going to win one of the most ethical companies in the world award, but they don’t care. I think you do. And I think you can make things better Diane, Kelly and Larree. That’s who you are. I’m looking forward to the day I can trust the food I buy from Safeway again. When it happens I’ll write about it. With the same sized font. P.S. After you do something about your food safety see about fixing your website and app. You really don’t want a long letter from me exploring everything wrong with it.